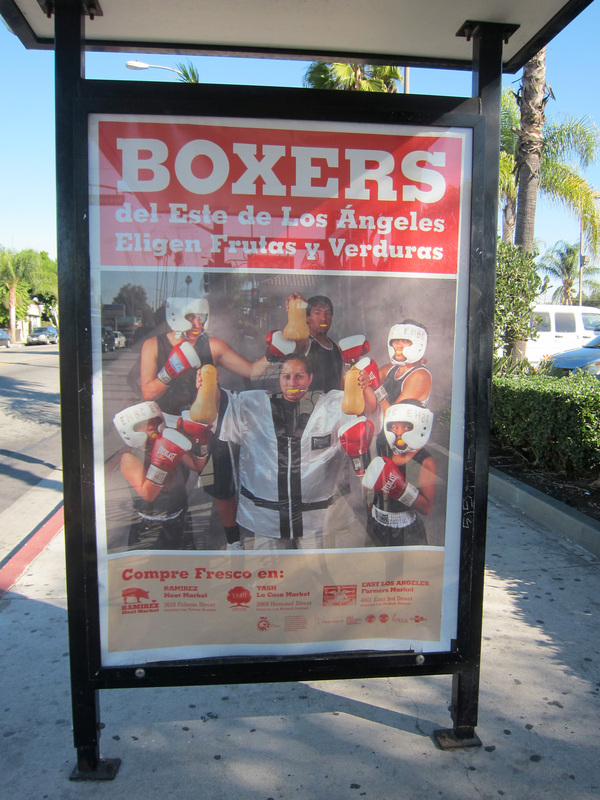 For Public Matters, social marketing consists of equal parts creativity, community engagement, and humor. The social marketing campaigns for Proyecto MercadoFRESCO relied not only on a healthy serving of oversized fruits and veggie costumery, but on home-spun, peer-to-peer forms of social engagement. 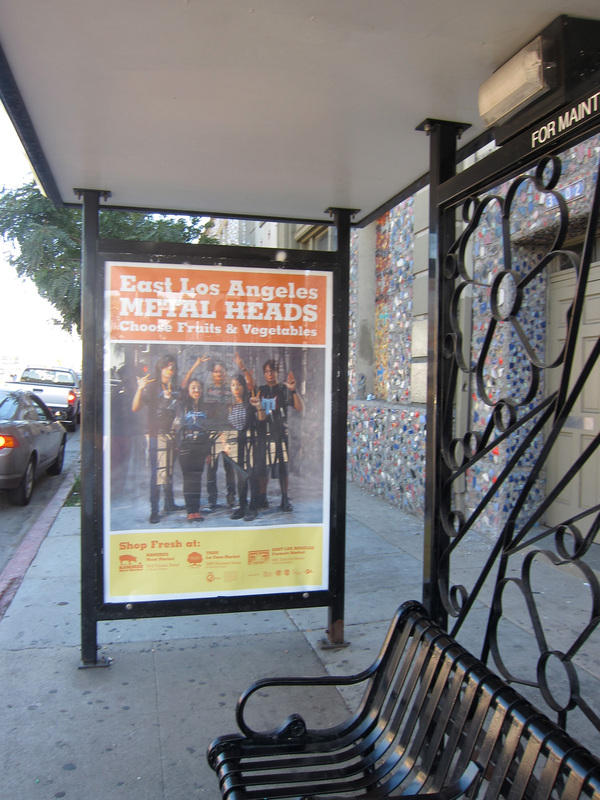 The bus shelters of East L.A. became just a little bit fresher with the launch of UCLA CPHHD Proyecto MercadoFRESCO’s Social Marketing Campaign featuring various East L.A. groups with fruits and vegetables. Public Matters worked with students from the East Los Angeles Renaissance Academy (ELARA) at Esteban Torres High School to develop and produce the whimsical campaign to promote both fruit and vegetable consumption and the newly transformed MercadoFRESCO stores in East L.A., Yash La Casa Market and Ramirez Meat Market. Students took the lead in casting the groups (11 in all) and assisted photographer Mark Ream with the photo shoots (props, costumes, production assistance). 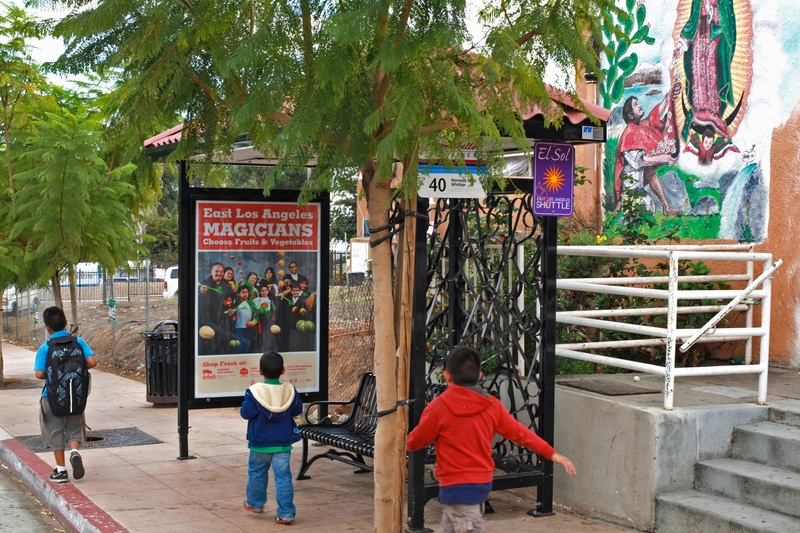 Public Matters worked with awesome graphic designer Marlene Franco to bring the posters to life. 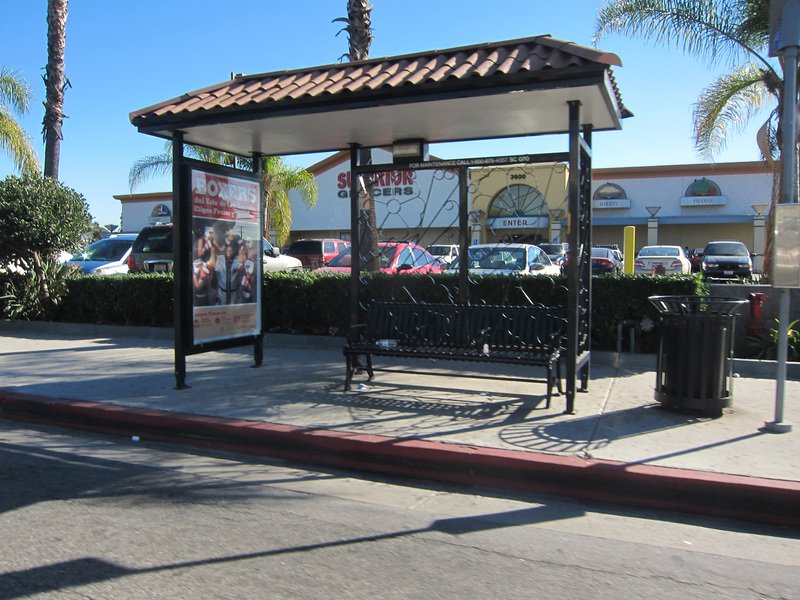 Our wonderful partners at Volunteers of East Los Angeles (VELA), the Office of L.A. County Supervisor Gloria Molina (D-1), and the L.A. County Department of Public Works provided additional support, enabling the campaign to expand to 45 bus shelters. In 2013, the Community Liaisons and Public Matters had the honor of working with and learning from Marie Estrada, social marketing guru. 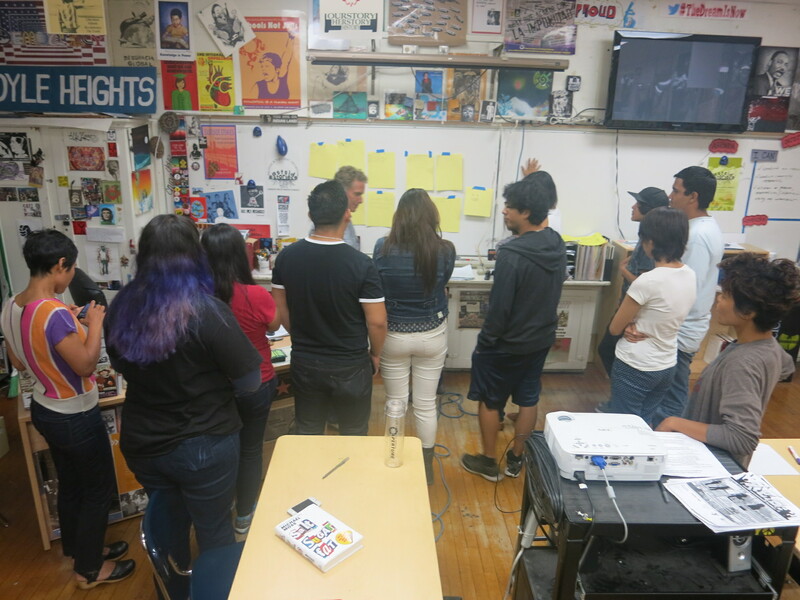 Marie provided an introduction to marketing on the first day of the summer program, leading a discussion on marketing and promotion strategies in both East LA and Boyle Heights. 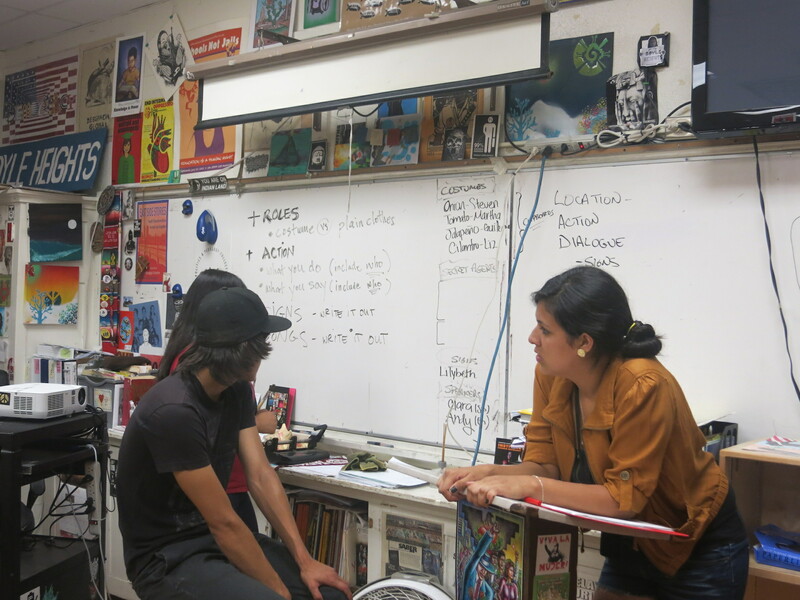 She also worked closely with the Community Liaisons to help them understand the importance of storytelling, and aided them in writing and telling their own stories. Why are they a part of this program? Why do they care about healthy food access and healthy eating? What are they doing about it? 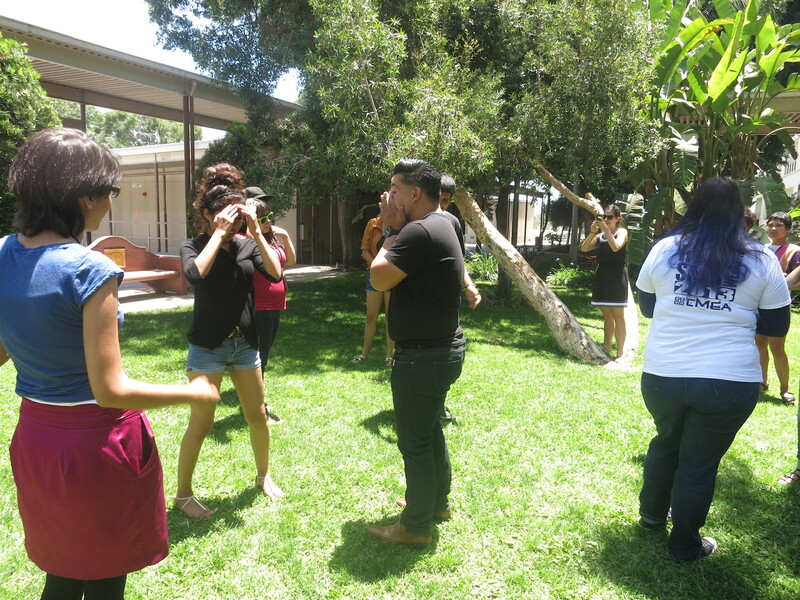 Community Liaisons also practiced reading their stories out loud, and recorded each other in front of the video camera. 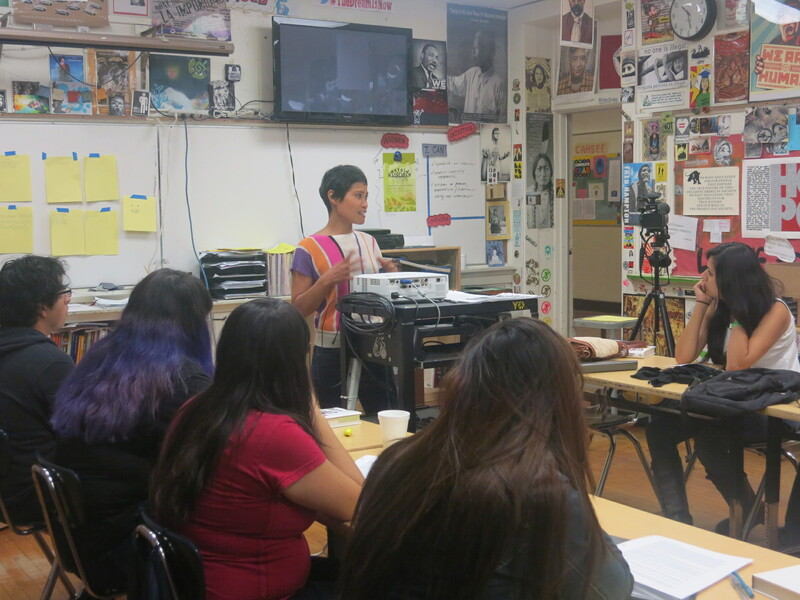 Marie also worked with the Community Liaisons on developing skits that could be performed at public events to raise awareness about the markets being transformed and the importance of healthy eating. Three skits were developed, rehearsed and refined over two weeks. Collateral materials were created. Roles were swapped so everyone could recite everyone else’s lines. 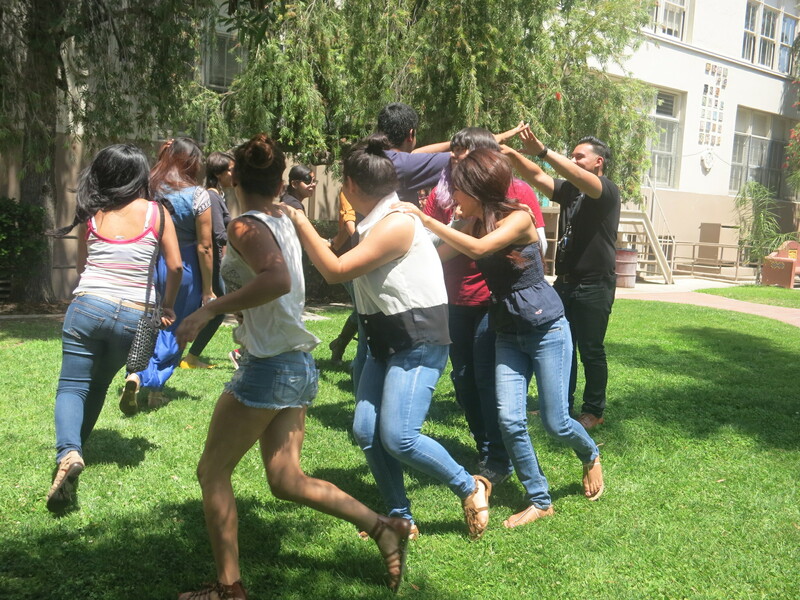 Having started with their personal stories, the Community Liaisons had a much easier time writing the skits, and during all of this, everyone had a lot of fun learning. 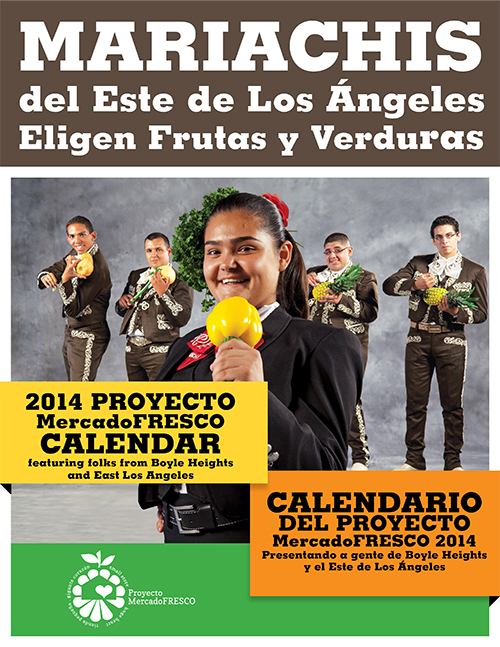 In time for the start of the new year, the 2014 Proyecto MercadoFRESCO calendars flooded the grocery bags of Euclid and other markets. 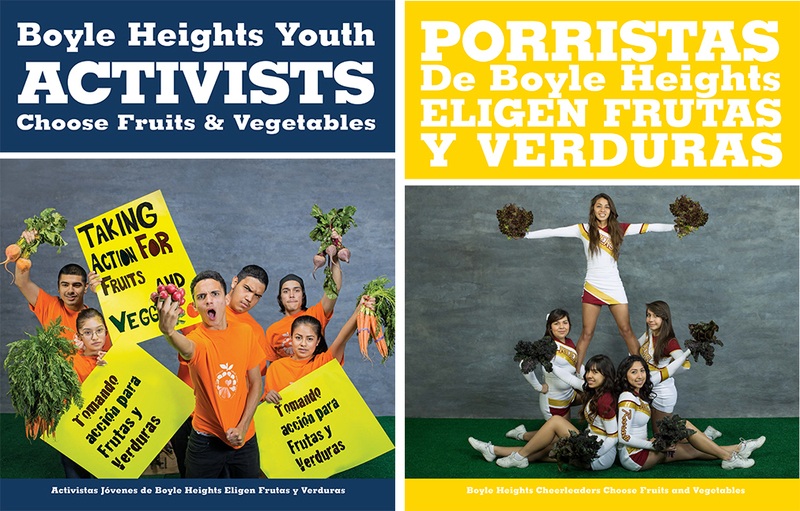 The calendar features groups from East Los Angeles and Boyle Heights with fruits and veggies – all the better to promote healthy and tasty eating. 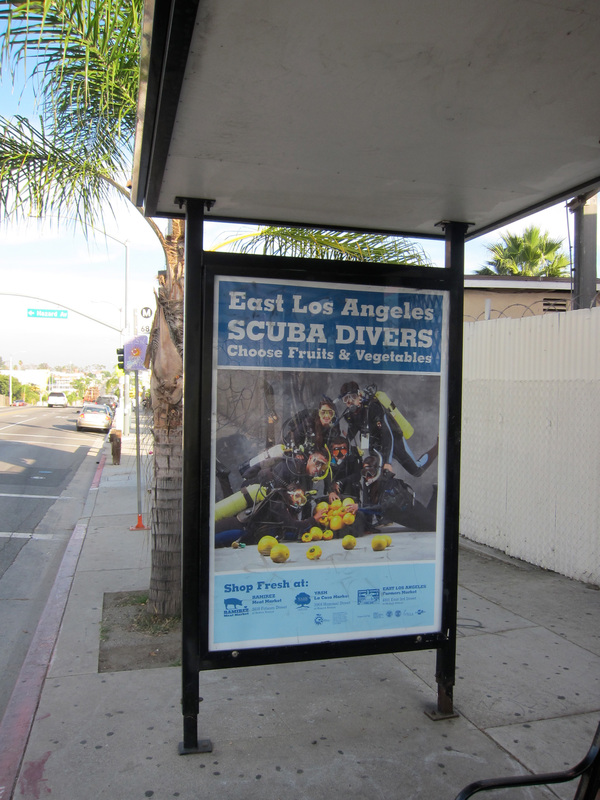 Photographers Mark Ream (East Los Angeles groups) and Gina Osterloh (Boyle Heights groups), graphic design from Amici Design with production assistance from Marlene Franco and Jackie Illum, and the lovely folks featured from East LA + Boyle Heights made this truly collaborative project happen.